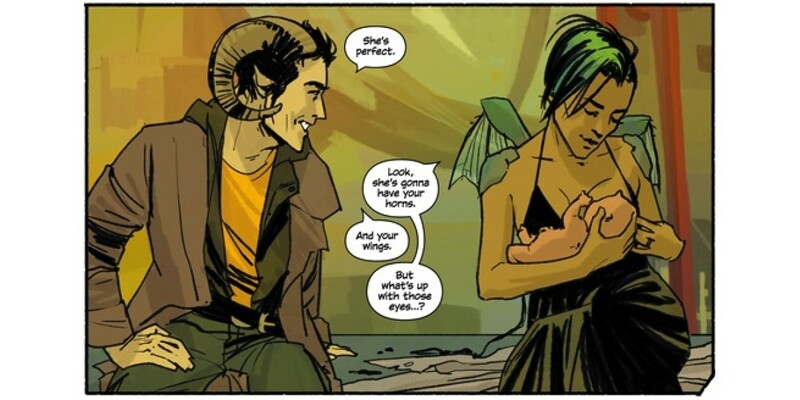 On Saturday, July 26 at the San Diego Comic-Con, Brian K. Vaughan and Fiona Staples announced to a packed audience at the SAGA panel the November release of SAGA: BOOK ONE, the first in a series of deluxe hardcover volumes of their award-winning and beloved Image Comics series. Collecting the first three paperback volumes of SAGA, the 500-page-plus BOOK ONE will feature brand-new cover art by Staples. It will be released on November 25. As Vaughan and Staples revealed in their Comic-Con panel, the cover of each hardcover edition will feature the series’ main character, Hazel, at a different stage in her life. BOOK ONE’s cover depicts Hazel breastfeeding as an infant. Telling the story of a family escaping an interplanetary war, SAGA is an ongoing comic book series, released monthly by Image Comics. It has won a Hugo Award, a British Fantasy Award, and multiple Eisner and Harvey Awards. All three volumes of SAGA have reached number one on the New York Times best sellers list, and volume one has been in the top ten for more than seventy weeks. SAGA’s next issue, #22, will be in comic book stores on August 27. Three trade paperback collections are now available, and SAGA: VOLUME 4 will be in stores in December.